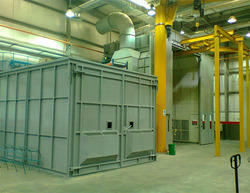 Offering you a complete choice of products which include grit blasting room and standard blasting cabinet. Focusing on the variegated demands of our respected clients, we are offering a wide range of Grit Blasting Room. The offered product is used by various industries that require surface preparation before the application of a protective coating. This blasting room is fabricated by our experienced team members who make use of excellent quality components in sync with the latest technology. The product is pre-checked on several quality parameters before they are made available in the market. Further, clients can avail this at market leading price. MEC offer a variety of blast room designs and room configurations which allow to design a blast room facility uniquely tailored to meet the economic production, safety and environmental concerns of each customer. The modular blast room is specially ventilated and illuminated for enclosed abrasive blasting, and is fully sealed, dust tight, all steel structure. The components are prefabricated for simple bolt-together erection, with little or no site welding required. The enclosure stands by it's own structural support without connections to the surrounding facilities. Several add-on accessories are available to increase efficiency of Blast Room System. We have emerged as a leading organization, engaged in offering superior quality Standard Blasting Cabinet. The provided cabinets are widely appreciated for their excellent quality, durability, and reliability. These cabinets are made under the supervision of trained professionals in sync with industrial standards by using top notch material and advanced technology. The offered product is the rare combination of impeccable design and sturdiness. Moreover, we ensure delivery of excellent quality products at best price. MEC offers an environment friendly cabinet type abrasive blasting machine for generating anchor pattern on components that can be handled in a cabinet enclosure and operator maneuver the blasting nozzle from hand holes provided at the front of cabinet. To view the blasting operation, a vision window is provided at front side. 3 variants are available in the cabinet type blasting machines, viz., Suction blasting, Pressure Blasting & Wet Blasting. Suction Blasting : Works on Injection Suction principle of blasting. Uses the venturi principle to draw abrasive from a non-pressurized hopper to the blast gun where it is combined with the compressed air stream and propelled against the work surface. Suction blast machines are most easily distinguished by having two hoses (one for air and one for abrasive) running to the blast gun. Pressure Blasting: Works on Direct Pressure principle of blasting. Uses a pressurized vessel or "blast pot" that holds the abrasive media. In a pressure blast machine the air pressure in the vessel and in the "pusher" line is the same. This means that there is no pressure differential between the blast pot and the blast line – this allows the abrasive media to meter into the air stream at the blast pot and then run the length of the blast hose out to the nozzle. Pressure abrasive blast equipment has a single hose running to the blast nozzle. Wet Blasting: Works on Injection Suction principle of blasting. Uses a slurry pump to draw the wet slurry of very fine abrasive and water to the blast gun where it is combined with the compressed air stream and propelled against the work surface. Track with work car & mounted turntable. Any other special custom feature.